Actor and large person Jason Momoa is best known as Khal Drogo from the first season of Game Of Thrones. If you weren’t sleeping through it, you may’ve also spotted him in a quick turn as Aquaman in Batman V Superman: Dawn Of Justice, a role which he’ll inevitably be called on to reprise in Zack Snyder’s expanding, dark-blue DC universe. Here he is, though, just doing him, and drunkenly throwing a tomahawk at a wall. Momoa is good at throwing a tomahawk. He is also good at drinking beer, if only for the way the foam clings to his beard and looks like tiny vampire fangs. 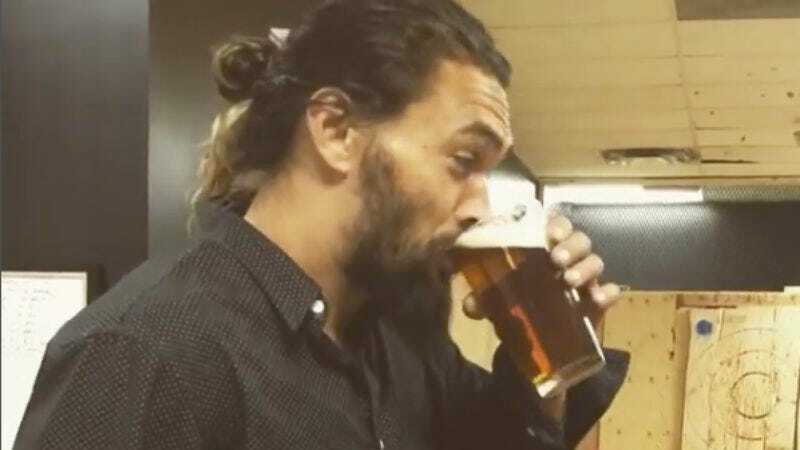 Momoa also apparently hires bearded, flannel-shirted attendants to hand him full beers when necessary. And yet—isn’t this all of us? Aren’t we all drinking beer in some poorly lit facility, throwing tomahawks at a wall and then retrieving them? One need not imagine Jason Momoa smiling as he rolls his metaphorical boulder up a hill; it is all here in this video.